Rosalie began her studies at the Royal Northern College of Music in Manchester, graduating with a first class honours degree in 2012. After several years of freelancing Rosalie moved to Belfast in February 2017, having being awarded a full time position with the Ulster Orchestra. 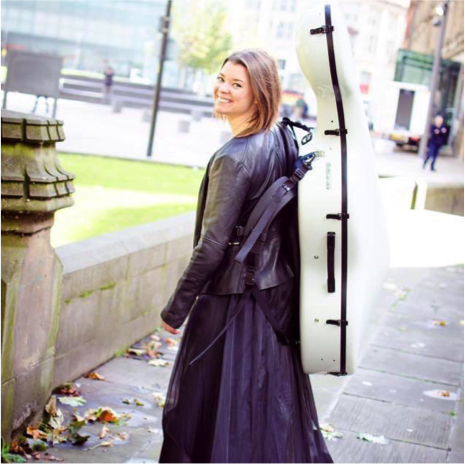 As well as working regularly with the BBC Philharmonic Orchestra, Philharmonia Orchestra, Manchester Camerata and The Halle Orchestra, Rosalie has been awarded trials for No.3 Assistant Principal Cello and No. 4 Cello with the Royal Scottish National Orchestra, as well as being awarded trials for several positions within the Royal Philharmonic Orchestra. She has been fortunate enough to perform all over the world in countries such as Germany and Poland, as well as Spain and China, to name a few. Rosalie is a passionate teacher, and has had an active role with Wigan, Bolton and Salford Music Services as a cello tutor and youth orchestra coach. She is a former string sectional coach at the prestigious Chetham’s School of Music and now works closely with the education and outreach work of the Ulster Orchestra.